The habit of separating ecclesiastical history from secular history has tended to make everything ecclesiastical appear more rarefied than it really is. It is only when we study church history as an aspect of secular history that we can begin to understand the limitations and opportunities of the medieval church and the vast distance that separates it from every modern church. I have a fond memory which has dimmed now to a mere photograph in my mind: listening to R.W. Southern deliver a lecture at Oxford. I can’t remember the precise date, it was I think the Hilary (winter) term between 1991 and 1992. Here was one of the world’s leading medievalists, who redefined the practice with his 1953 work The Making of the Middle Ages that I was reading at the time. Here I am thirty years later, a first person witness of this event, and interested in the subject and I can barely remember anything about it. The medieval historian has to recreate the world from a millenia ago. Southern does it so well. Southern is a specialist in finding threads through deeper foci on several topics, not touching on the usual suspects. It’s hard for Thomas Aquinas not to play a central role in any credible, much less leading, scholarship in the middle ages. Southern’s books have him in the supporting cast, with barely a mention. There are three main themes: two of which are pretty standard the relationship between Emperor and Pope, and East-West relations (“To the Greeks, it was absurd that a man like Chrlemagne, who could not read, should preside over a council of insignificant bishops and lay down the law on difficult doctrinal issues.” ( p.63)). The divide between Roman and countryside opinion is something better detailed than I’ve read elsewhere. 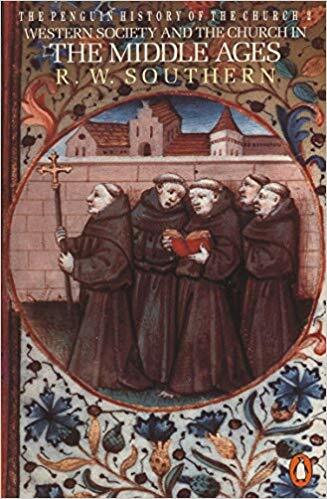 The book really shines in the portraits of the Monastic Orders. Sections can nearly feel ghostwritten by Peter Drucker – this is about the specific pros and cons of management of these religious institutions, and how they related to the rest of society. For the first time the distinctions between Benedictine, Augustinian, Cisterician, Dominican, and Franciscan orders came alive for me. What is the right amount of hierarchical organization? Where does it any answer to that question prosper best? To use a phrase often associated with the medieval world, Southern’s history was illuminating on these questions.